This release of Waterworld includes one of the best film documentaries I’ve seen, Maelstrom: The Odyssey of Waterworld. A long time ago, in a galaxy not too far away, Universal Pictures released the most bloated, and expensive movie of all time (prior to Titanic). At the time Waterworld was released, it seemed that it could do nothing right in the eyes of critics and movie-goers, alike. 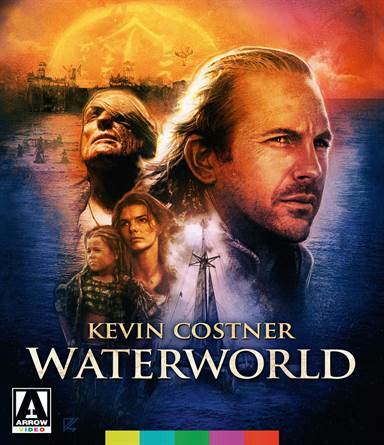 I remember disliking it, immediately, although that was due more to my dislike for Kevin Costner (Bull Durham, Dances with Wolves) and for my obsessive love for The Road Warrior, than any real hatred for Waterworld. After all, it was a post-apocalyptic film and I love those. It had Dennis Hopper as The Deacon (Easy Rider, Blue Velvet) doing some fine scenery chewing, and Jeanne Tripplehorn, as Helen (The Firm, Basic Instinct), not to mention a ton of excellent supporting actors. Now, 23+ years later, Arrow Home Video has released the definitive version of this buried treasure, and, like all their releases, they have outdone themselves. In the future, long after the melting of the polar ice caps in the 21st century, the sea levels have covered every continent on Earth. The remains of human civilization live on ramshackle floating communities known as atolls. People believe that there should be a mythological "Dryland" somewhere in the endless ocean. A mutated mariner fights starvation, The Deacon and his outlaw "smokers," and reluctantly helps a woman and a young girl try to find dry land. As I said before, seeing this film in the theater, I was immediately struck by the overwhelming similarities between it and Road Warrior. I don't know why I was put off when so many Italian Directors had released more blatant rip-offs, maybe because they had the charm of a low-budget, and seeing a "Hollywood Blockbuster" be so obvious, seemed more insult than homage. Whatever the case may be, I take it back. I take it all back. Waterworld is a fun, and action-packed, post-apocalyptic romp. From the elaborate setting of the Atoll to the Mariner's Trimaran, which is the equivalent of Mad Max's Interceptor (though not as cool) to the Assault of the Atoll by the Smokers and their Quad 50-Cal attack boat the stunt work is really unmatched. I'm sure you've seen this movie already, so I don't have to go into the story, but I will say this, Costner plays the Anti-hero pretty well, even when he is tossing the too-cute Enola, Tina Majorino, (Napoleon Dynamite, Big Love) overboard, there's a gleeful nihilism twinkling in the Mariner's eyes. The Blu-ray will be twinkling in your eyes as well. This 4K scan of the original negative by Arrow in Hi-Def 1080P presentation is excellent. This film has, really, never looked so good. I found myself staring at the screen throughout the entire run time of 178 minutes (The Ulysses cut is the best of the three versions). The world is vibrant and alive, from the population's facial details, and the textures of their clothing, to the virulent, green compost, in the Atoll's "Recycling Pit", the cerulean blue skies, and ocean waves, even the rotten, rust-red of the decaying tanker, and into the inky blackness of The Deacon's Tanker-kingdom, this film has such great clarity and depth. It's like I'm seeing it for the first time, not to mention hearing it. The 5.1 DTS-HD Master Audio is absolutely immersive, and the explosions, and gunfire, the Smokers Jet skis, and quiet moments of dialog, which are always up front and flawless, or even the hushed interiors of the windblown and forsaken huts. Let me not forget the soundtrack by James Newton Howard, which was always one of my favorites, adds such immediacy to the action sequences, and a forlorn whimsy that is specifically Waterworld. Now, the special features, including one of the best film documentaries I've seen, the feature-length, Maelstrom: The Odyssey of Waterworld is a wonderful addition. Easily the most comprehensive, with interviews with cast, and crew, the director and producers, and screenwriters, all add great anecdotes and help reveal all of the making-of-madness they were subjected to during that time. Dances with Waves, an archival featurette, Global Warnings, a review of environmental, Post-apocalyptic films, and more. They even included 6 collectors' postcards, almost like mini lobby cards, a double-sided poster and a 60-page booklet. I ended up watching this movie with my son, it was his first time watching it, and he has been exposed to many films from the '80s and '90s, including The Road Warrior, and afterward, he looked at me and smiled and said he "really liked this movie". It didn't matter if it was the Road Warrior on water, it was fun to watch. I think he hit the nail on the head, Waterworld, in spite of its shortcomings, is a fun movie to watch. The sacrifice of realism and logic for the sake of enjoyment is something we do when we watch most Sci-fi/Action films. In this case, hindsight being 20/20, Waterworld is definitely not ALL wet. Download Waterworld from the iTunes Store in Digial HD. For more information about Waterworld visit the FlickDirect Movie Database.